We had a fun little snow storm pass through here at the end of last week. The temperature was right at the freezing mark, the wind was blowing east to west of all directions. The wind speed had enough gusto to give the appearance of the snow falling sideways. It was a heavy, wet snow that was clinging to anything in it's path. 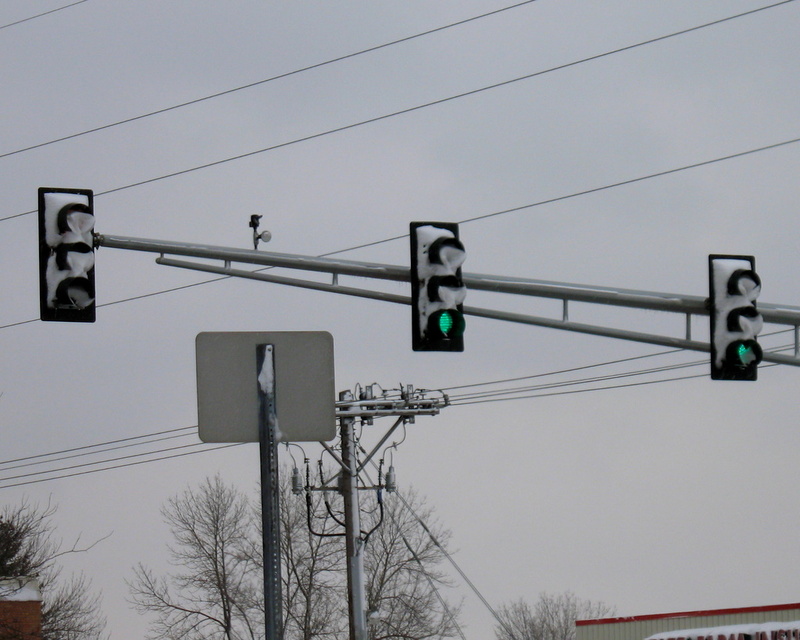 When I drove down Cliff Road on my way to work, I did all I could to see what color the stop light was. In reality, I had to look at what the lights on the cross streets was to decide what the color of my light was as I approached the intersection. When I made a return trip down the opposite direction on Cliff Road, the heat from the 'green' light was enough to melt the snow off, but the red and yellow shows what all three of the lights looked like. This has got to stop! Nice capture of the snow inside the yellow and red parts of the light. It looks wild and COLD! I want some 40's and 50's back! Have a great day.